Events are fun. You meet new people, talk about emerging trends, feel the electricity in the air and return happy. Specially after being cooped up for long hours, blogging about our favorite topics, stepping out to bask in the freedom is amazing! And if the clothes you wear to such a soiree, flow and move with your rhythm, the fun just doubles. Recently we attended an event #UnboxWithLiva which promised freedom and fun from the word, GO! Now, we had heard a lot about Liva, a new age fabric that is stylish, fluid, easy on the skin and environment from the house of Aditya Birla. The invite included our favorite hobby- shopping! So off we went to find that perfect ensemble made with Liva for the perfect evening. We chose an elegant, flowy and ultra chic ensemble from Global Desi and prepared for the evening ahead. We reached the venue and noticed the upbeat decor, the easy banter among fellow bloggers and started posing for pictures in our new outfit. It was a beautiful sight!! All invitees including RJ Archana and the effervescent Freishia were dressed in classy, fluid, elegant & colorful ensembles made with Liva. We quickly exchanged notes with one another about how the fabric felt on our skin....and everyone spoke about feeling super comfortable, free and absolutely loving the drape of the fabric against their frames- small, petite, skinny, heavy...Liva had pleased them all. The event unfolded with the host for the evening, lovely Freishia starting the fun with a few games and a quick question to us all- "What Does #Unboxing Mean To You". Now that got us thinking. What does it really mean...feeling free? feeling fluid everyday? Not boxy? And to us, it meant all of these things. Exactly how you would feel after wearing a Liva garment-fluid, flowy, free and #Unboxed!! The Beautiful Drape of the Liva Fabric. Bloggers indulge in some fun at the event! Liva has collaborated with leading names in the fashion industry to offer collections, that will appeal to women all around us. We always want something exciting, new, cutting age and different to wear and Liva, will be an answer to all of that we desire. Moreover, Liva promises to be easy on our conscience too by being eco friendly, sustainable and organic. 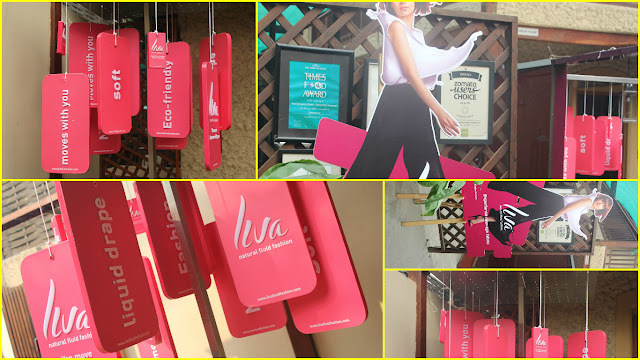 So if you are looking for stylish ensembles that breathe and feel just right on you, try Liva! The fabric will drape beautifully, accentuate your body, helping you feel free, stylish, close to nature and truly....#Unboxed. By now you must be tempted to try Liva just like we were. You need not flip through fashion magazines to look for designs that you desire. Just step into a store near you, as Liva is widely available with known brands like Pantaloons, Global Desi, Code, Akriti and more. Happiness is all about feeling free, fluid and #Unboxed.